Fourth Row Center: Film Writings by Jason Bailey: In Theaters: "Kings of Pastry"
In Theaters: "Kings of Pastry"
The blue, red, and white striped collar is worn by French chefs who have been awarded the honor of M.O.F. (Meilleur Ouvrier de France), after a rigorous and complicated competition that is only held once every four years. If the collar is worn by anyone who is not an M.O.F., they can go to jail. So yeah, they take it pretty seriously over there. Kings of Pastry, the new documentary by Chris Hegedus and D.A. Pennebaker, tracks three of the sixteen M.O.F. semi-finalists through the final days of their years-long prep for the competition, and walks with them through the fast-paced, nerve-jangling event. 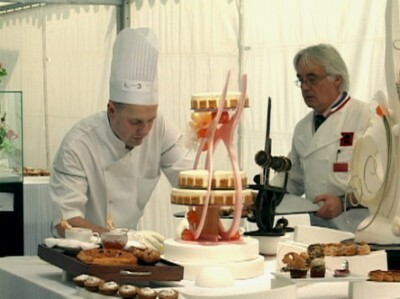 The primary focus of the picture is Jacquy Pfeiffer, a Frenchman currently living in Chicago (where he co-founded the French Pastry School at City College of Chicago). Jacquy clearly longs for the honor—the school’s co-founder, Sebastien Canonne, is an M.O.F, as is their guest instructor Philippe Urraca. His practice sessions are a kick to watch, thanks to his impromptu sound effects and tossed-off wit; regarding his sugar sculpture, he notes, “I just need one, but I’m gonna make nine… in case I break eight.” Sampling an intricately-designed wedding cake (it seems to have about a dozen layers), he takes a bite, muses “It’s a good step, eh,” and tosses it in the trash. The last third or so of the film focuses on the competition, and it’s pretty compelling stuff—big, tasty close-ups, up-tempo old French music, terrifying walks with their huge, precarious sculptures. But Hegedus and Pennebaker can’t seem to find anywhere in particular to go with it, and the third act becomes increasingly reliant on simple montages of cooking (and later, tasting and judging) to music. Sure, it’s involving—the clock ticking, the chefs literally running things out and back, improvising madly—but is it more skillful than, say, your average episode of Top Chef? Pennebaker is one of the founding fathers of the modern documentary movement (he photographed Primary and Crisis and directed Monterey Pop and Don’t Look Back, among many others); he and wife Hegedus have collaborated on several more recent (and excellent) docs, including The War Room and Elaine Stritch: At Liberty. They do an adequate job here, but it’s a somewhat underwhelming picture, considering its legendary creators—perhaps because it seems so technically deficient (it’s shot in ugly full-screen digibeta, as if 24 fps and HD cameras haven’t been around for several years now, and uses the chunky, awkward on-screen text of a student film), perhaps because it never quite pushes past the dramatic investment of an above-average reality competition show. It’s a good film, but suffers in comparison to something like last year’s Pressure Cooker, where the stakes are real and the emotion is overwhelming. Kings of Pastry offers some pleasant diversions (the engaging personalities, the mouth-watering delicacies), but never quite reaches the high bar that’s been set by the filmmakers’ previous works. "Kings of Pastry" opens Wednesday, September 15 in limited release. On DVD: "Community: The Complete First Season"
On DVD: "My Son, My Son, What Have Ye Done?"